An interesting twist on pancakes, unfortunately these ended up more bad than good. First the good: the pancakes have a light and delicate taste, with a wonderful lemon flavor that happens to be a great combination with the ricotta cheese in the batter. They are relatively easy to make, and they cook up quickly. And now the bad: first of all, this isn't the standard pancake batter. Eggs need to be separated, whites need to be whipped and folded into the rest of the batter, blah blah blah. In theory, this is all to make the pancakes light and fluffy, but the amount of ricotta cheese in the batter makes these surprisingly heavy instead. The pancakes ended up being a little too cheesy, and ricotta has that gritty texture that made these kinda weird. On top of that, they cook up a little too quickly and, as a result, end up barely cooked in the middle. Now when I think of the word "souffle," I think light, fluffy, airy, eggy. Eggy these pancakes were (and barely sweet), but none of the other characteristics. 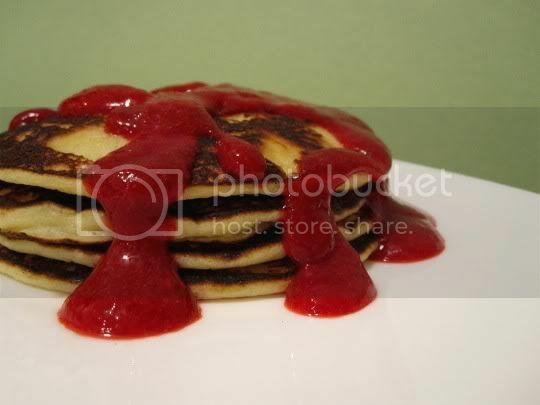 The saving grace for these may have been the raspberry sauce on top, which added a fresh sweetness and tartness to the otherwise heavy and cheesy pancakes. These must be served with some kind of fruit sauce and maybe a cream (sour cream, creme fraiche, whipped cream, etc.) to complement the lemon: raspberry, blueberry, or strawberry sauces would be good. Just remember to keep any accompaniments fresh-fresh-fresh and light to combat the heaviness. Make again? No. This recipe needs major tweaking, but I don't think it's worth it in the end. Pancakes & Waffles, Lou Seibert Pappas, San Francisco: Chronicle Books, 2004.